When Mu Lu is missing two health he reduces his maximum by one. Then all of the damage caused by his attacks is increased by two. He can then only use one attack per turn and cannot have any equipment. Once per turn, he can force all players with horses equipped to attack another player that is one distance away. If they do not they lose one health. Whenever Mu Lu receives lightning damage, the damage is increased by one. "Beast" is very similar to an awakened ability, but Mu Lu does not need to wait to have it activated. It happens as soon as he loses a second unit of health. Mu Lu must be missing two units of health at a particular time to activate "Beast". If he heals after only missing one health, he will need to be damaged twice. After Mu Lu activates "Beast" he cannot have any equipment. If he had some as the ability activates, it is all discarded when the power works. Also he then is limited to attacking only once per turn. Even though he cannot have the Crossbow, he also cannot be helped by other character's abilities, such as Guan Ping's "Dragon Roar". The attack limitation of "Beast" does not apply to attacks used in a Duel. 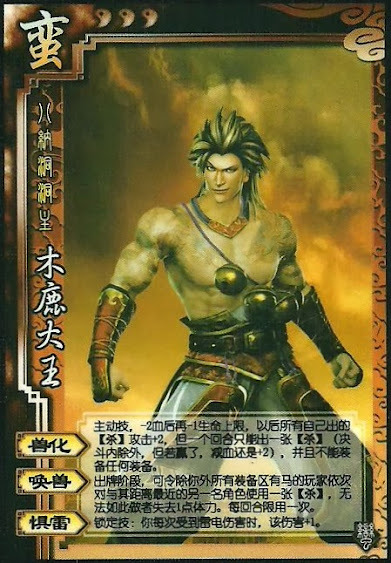 "Summon Beasts" works the same way as Jia Xu's "Upheaval". The difference is that only people with horses equipped need to play an Attack. "Fear of Thunder" applies to all lightning damage, not just damage from the Lightning and must be followed when applicable.